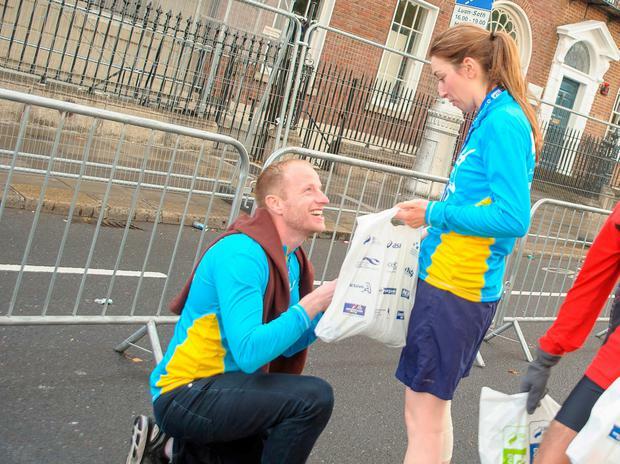 Romance was the real winner of the Dublin Marathon with one runner passing the finish line to get down on bended knee to win a 'Yes' from his girlfriend. Shane Callaghan (28) from Carlow, set his plan in motion to propose to girlfriend Marguerite Kinsella (32) earlier this year, when he signed up the Mater Hospital nurse for the 42km run. He kept his plan a secret aside from asking for the blessing of his and Marguerite's parents. "I got the idea back in May," Shane said. "Marguerite had never done a marathon but said she always liked the idea, so I signed her up and we started training together. I just remembered the first marathon I'd done and getting to the finishing line and being so emotional. I thought what better way to propose than in such an amazing moment." Shane finished in 3hrs 49min and waited, ring in hand, for Marguerite. She finished after 4hrs 50min and was stunned when she saw her partner on one knee. "I thought he'd hurt himself," she said. "I went over to see but then he proposed." Yesterday the couple went shopping in Dublin to buy the perfect engagement ring. Marguerite raised funds for ICU Steps, an intensive care support charity, and Shane ran for Carlow seven-year-old Callie Kavanagh who has a rare cancer, Ewing's sarcoma.